Hi ya'll! I'm very excited to be writing this post today, mostly because this is an event I have always wanted to participate in, but could never really find the time. This time around, I pretty much decided to ignore the fact that I'm probably going to be super busy and sign up anyway. 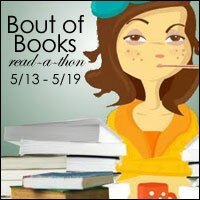 So, here it is in an official capacity: I am signing up to be a part of Bout of Books 7.0! Now that we've gotten those details cleared up, it's time for me to let you guys know my goals! It's not a requirement to include these, but I love making lists and I love the satisfying feeling of crossing stuff off of my list once I've accomplished them. Since I'm going to be a bit preoccupied that week (with a trip to Boston to hang out with Gaby, and a hangout with Cass happening), I thought I'd keep them fairly light. Participate in 1 Twitter chat. I'm pretty excited to finally be a part of this event! I know a few of my blogger friends are always excited whenever Bout of Books comes around, so I can't wait to join in and find out what the fuss is all about. Join me and other bloggers if you can! I will also be using this post to update you on my progress during Bout of Books, so that everything is consolidated into one post and will be organized in a way that pleases my slightly OCD self. For all of her life, Isabel "Izzy" Collins has been... well, she's been different. When little girls were busy playing with dolls or having tea parties, she was eagerly learning to thread a needle and creating her first customized outfit. As the school year draws to an end, and summer draws ever nearer, Izzy has the opportunity to win a scholarship for a fashion design summer camp. The only catch? She'll have to design an entire line of clothes before the deadline hits - a little under a week. Normally, this would be no problem at all, of course, with Izzy's deft fingers and inspired designs. But Josh David has decided to make Izzy his latest conquest, and he will stop at nothing to get her attention. And to Izzy's surprise, she might actually like him. What will she do now? I'm particpating for 7.0, too and I'm really excited. I've never participated in any kind of readathon, and like you, I'm fairly busy that week. But I decided to give it a try anyway. I still have to put together my goals. I think reading 7 books is a great goal! Ahh! I've seen so many blogs posting about this and i SO want to do it, but next week is my last week of college EVER, so i need to focus on that. i'm thinking of maybe having my own little read-a-thon the week after? a delayed read-a-thon, huzzah! Good for you!! I really wanted to do BoB but like you, I just don't have the time. 7 books is a great goal! Good luck!!! Ahhhh, you can do it! I still need to do a BoB sign up/goals post as I always have so much fun participating. I love the books you've picked especially The Sea Of Tranquility. Wow, good luck with your challenge, Alexa! I know you'll blow through the Elementals books in no time, and Sea of Tranquility (for all its seriousness) is a pretty fast read, too. I'm impressed you have so many epic fantasies in this list, though--those always take more time for me. Will be watching and cheering you on! Something Strange and Deadly. YES. It's one you must read, so we can discuss it! I really hope you get to all your ones on your list, but I selfishly hope you read SSAD first. I also hope you get to some of the Elementals books because I haven't read them yet, and I need someone to convince me to start them! I joined Bout of Book read-a-thon too. It takes place during my final year of high school so I'm going to be super busy, but I hope to get some reading done. Whew your goal is higher than mine! I challenged myself to read 3 books... aim low is my motto! Good luck to you and I hope you enjoy the week! Wow you are really going for it ;) Good luck! Enjoy your first Bout of Books! You finished 2 books on the first day! Nice start! Great job completing 2 books already! Hope you read the House at the end of Hope Street, and I hear Sea of Tranquility is good. Hope you enjoy your reads! Here are my Bout of Books Read-a-thon Goals and updates if you'd like to stop by. 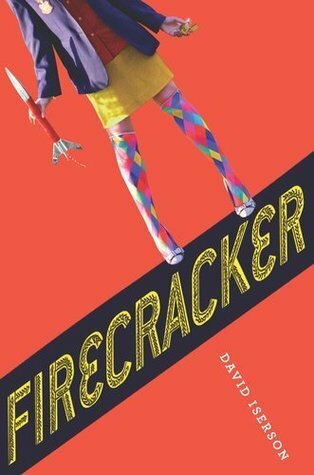 PRETTY SURE I want to read ALL versions of Firecracker. Please make I have them. Also, YOU ARE A CRAZY READING MONSTER AND I AM SO IMPRESSED WITH YOU.